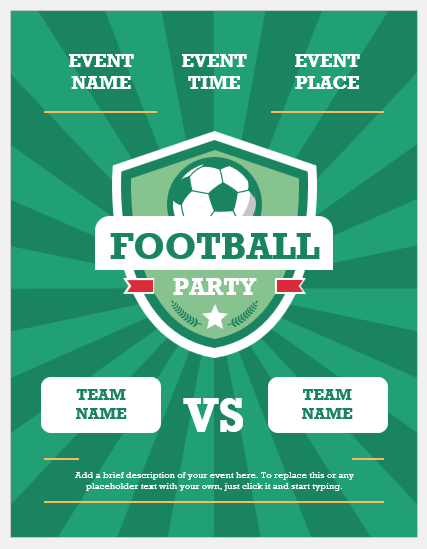 During football season, the football lovers organize the football parties. The aim is to enjoy the game with a good company. It can be an outdoor and indoor tailgate party. Different football food like delicious snacks, junks and beverages are a must-to-go in these parties. The theme and decorations are solely football based. A well-designed flyer is sent to the respective group of people with the relevant information of the day, date, place, and time. The following flyer is designed with a classic and dazzling color combination. The color combination of teal and soft teal symbolizes rejuvenation that perfectly goes for a football party theme. The sunburst background is looking spirited. The top is positioned with the event name, event time and location. The middle has a clip art of the football logo. The name of both teams is positioned with bold font under it. The bottom has a brief note concerning the event. 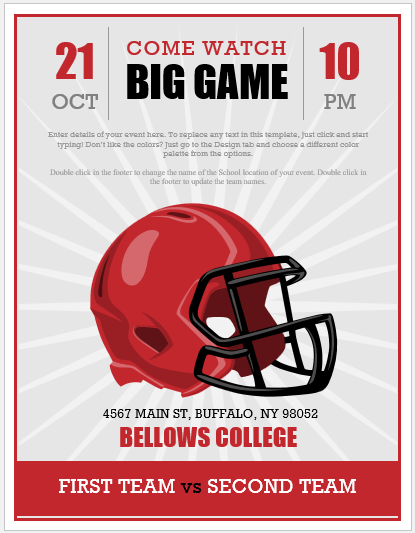 This flyer could be chosen for all those football parties where spirit and energy for the game watch are on full swing. The flyer as follows has a sunburst background of middle sky blue and ocean blue color. These colors collectively represent loyalty and confidence. The top consists of event name, place, and time. Then, a clip art of the title is printed in a cool way. After that, the name of both teams is placed who are about to face each other at the ground. The footnote is comprised of a relevant headline of the event. The flyer goes perfectly for a party where the mature and sensible audience is being invited. The flyer shown below is designed with red, thunder, white and a blend of black color. The sunburst background is looking very stylish. The red and black colors show passion. The thunder and white color indicate spirituality. The time and date of the event are printed on the top with an elegant invitation salutation. Some short pertinent declarations are placed then. A clip art of football helmet is positioned which is looking very exciting. The complete address and the name of both teams are placed in the end. 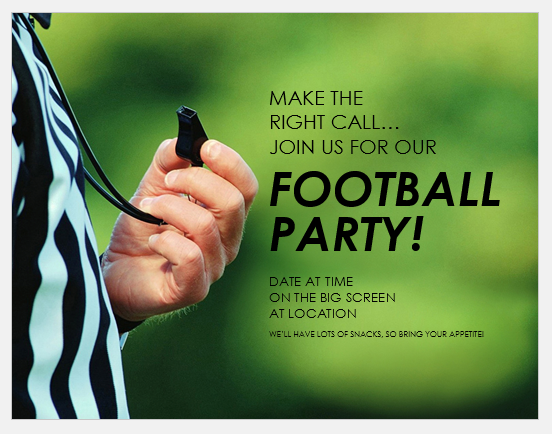 The flyer works perfectly for all kind of football parties. The flyer shown below has a vector pattern. The color combination of anchor and white is pleasing to the eyes. The anchor and white color collectively symbolize softness with good beginnings. The title is placed at the top with bold font. A clip art of football is placed in the middle. The time is printed in bold font with pertinent notes. The bottom left is positioned with a date. 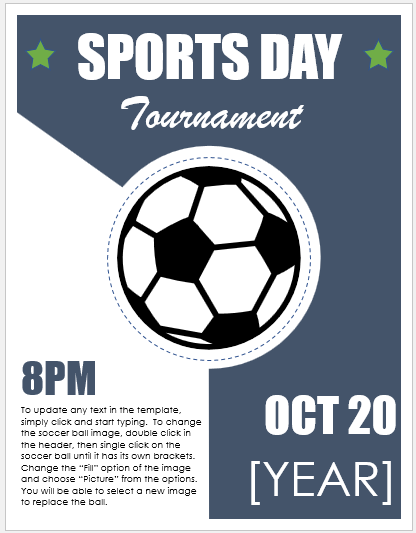 This well-designed flyer could be chosen for all school, colleges and university-based football tournaments. The flyer shown below is refreshing due to its color. It is designed with the watercolor textured pattern of pear and pine color. The pear and pine color symbolize energy and ambition. The left side has a dynamic photo of a referee holding a whistle. The invitation salutations are placed on the right. A short headline is stated at the bottom. 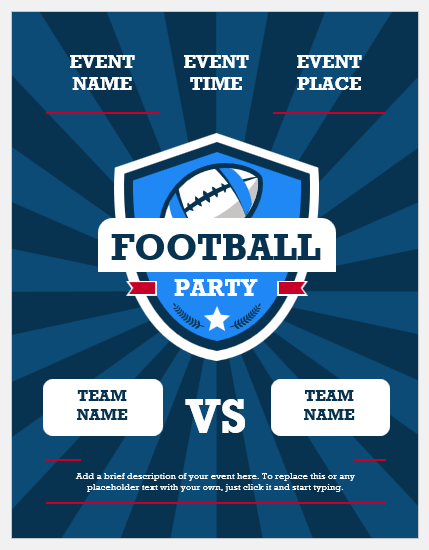 The flyer could be chosen for all indoor and outdoor tailgate football parties where appropriate and delicious football food is served along with beverages.